In the 12-story apartment tower, the target was a fourth-floor apartment where Hamas ran an operations center, according to Israeli media. 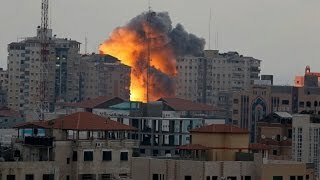 In the past, Israel has carried out pinpoint strikes, targeting apartments in high-rises with missiles, while leaving the buildings standing. However, this time a decision was made to bring down the entire tower, according to Channel 10, an Israeli TV station. The military declined immediate comment when asked why it collapsed the entire building instead of striking a specific apartment. Meanwhile, Gaza militants continued to fire rockets and mortar shells at Israel, including at least 10 on Sunday, the military said. That was in addition to more than 100 on Saturday, most aimed at southern Israel. Elsewhere, five rockets were fired from Syria and fell in open areas in northern Israel. It was not immediately clear whether they were fired by pro-government forces or rebel groups. Previous articleIs Big Brother spying on your computer – with your own cell phone?